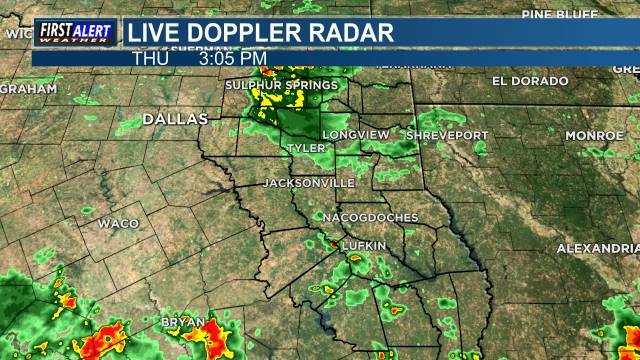 East Texas (KLTV/KTRE) - Welcome back and thanks for joining us. Another cloudy start to our day out here in East Texas. Here is a look at our Downtown Tyler Tower Camera, looks like the clouds are trying to break up. Temperatures are in the upper 30s and low 40s right now. The rest of the day in East Texas will be in the low 50s and upper 40s with winds out of the south at 5 mph. This is a look at the upper-level systems that are making their way towards us. On Friday a significant cold front makes its way in, dropping temperatures into the 30s and overnight lows to the 20s. We should be accumulating half to an inch and one half of rain through the weekend. Next few days in East Texas, temperatures are on the rise, reaching the upper 60s by Thursday and even seeing 70 in some places on Friday.